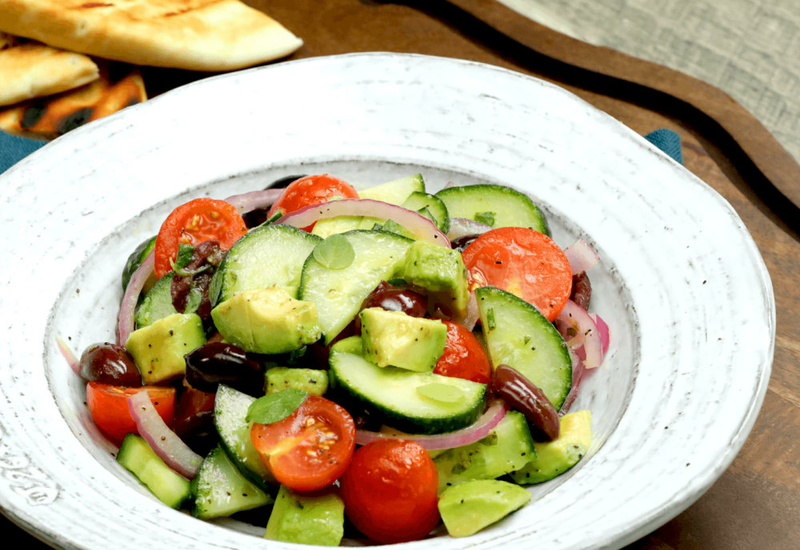 This salad combines the simplest oil and vinegar dressing with all the best parts of a Greek salad - crisp cucumber, red onion, tomatoes, briny olives, oregano, and creamy avocado. The key to optimum flavor is using fresh oregano. If you normally use dried oregano, you will love the bold elegance of this incredible herb. The crisp contrast of the cucumber and onion to the rich creaminess of the avocado is a delicious twist on the classic. It is a colorful dish that will have you declaring, "Opa!" Add grilled chicken to make this salad a complete meal! English hothouse cucumbers have a thinner skin and much smaller and fewer seeds than the traditional cucumber. They don't need to be "de-seeded" and can be sliced and served just as they are! Per Serving: 161 calories; 15g fat; 6.8g carbohydrates; 1g protein; 0mg cholesterol; 172mg sodium. Tasty, tangy, and quick salad. This went very well with my grilled chicken kebabs. I sprinkled a little feta on top to round out this salad. Very good salad. After years of not like avocado, this is not probably one of my favorite dishes. The dressing is so good, I put it on everything. This was a side dish for my grilled chicken pitas. I've never added avacado before and loved it! I topped with feta. Great salad! We tossed grilled shrimp in it for a light dinner. Definitely will make this again. The only thing I might change for next time is adding another avocado. I paired this Greek salad with za'atar spiced chicken, it was amazing. I also used two avocados, instead of one. You can never have too much avo on a salad, am I right? Simple to throw together, even the homemade dressing.